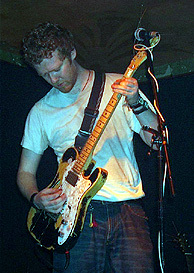 Sorted magAZine: Glen Hansard, Auntie Annies, Belfast, 28th January 2003. Having seen Mark Geary in the same venue almost a year ago, I was not expecting much. That gig did not overly impress me. I found his songs to be laborious and frankly quite dull. And so I was very pleasantly surprised by tonight's performance. He seems to have harvested a lot of his songs, cutting away the chaff and keeping the tunes shorter and more pronounced. I would be very interested in seeing him live again soon and will get the opportunity when he headlines Auntie Annies next month. This is the fifth time I have seen Glen Hansard live in the past 12 months (both as a solo artist and in The Frames). I have always come away impressed with both his songs and the entertainment value of the shows, and tonight was no exception. A rapturous welcome to the stage was greeted by a trademark smile from Glen, before he picked up the same battered guitar he has been playing for years and launched into his set. The one thing that did stand out from tonight was that it seemed to be more musically-orientated than the usual story session Glen launches into at most gigs. That is not to say he did not talk - he joked around, explained the meaning behind some tunes etc - but this time a lot more music was played. Perhaps he has been listening to some of the light-hearted criticism about his gigs, becoming slightly embarrassing with the crowd hanging onto every word. 'What happens when the heart just stops?' is truly a touching masterpiece. It really takes a gig like this to realise just how many classic tunes The Frames have. From 'Red chord' to 'Lay me down', they are all played here and sound more exceptional in such a secluded live environment than on CD. As Glen himself stated, tonight's gig was used as a testing ground for the seemingly vast collection of new songs waiting to be recorded. Even on first impression, they all seemed very promising and, although it was difficult to tell just from one listen, they did appear to be of a more simple formula, almost resembling The Beatles at times. I came away from this gig with one question on my mind - does Glen Hansard really need the Frames as a vehicle for his music or would he be best solo? From tonight's performance, I would go with the former. Although I said the same thing last year, I will repeat it again - see him live in a small venue while you still can.